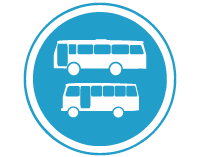 Purpose: Indicates that the road or portion of the road is set aside for use by buses and midibuses. Action: The driver of a bus or midibus shall only use such road or portion of such road. 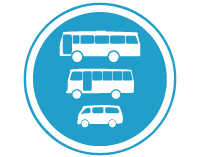 Purpose: Indicates that the road or portion of the road is set aside for use by buses, midibuses and minibuses. Action: The driver of a bus, midibus or minibus shall only use such road or portion of such road. Where: On any road where there are multiple roads intersecting. 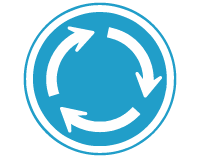 Purpose: To indicate that you must move in a clockwise direction at the junction. Action: Yield right of way to vehicle approaching from the right within the roundabout, where such vehicles are close enough to cause a danger or potential danger. Proceed clockwise at the junction if it is safe to do so.